I’m working on a new site. It should be ready in just a couple of days, but in the meantime, have fun reading the blog posts. Once, this city laughed and danced and sang like any other. In those days, there were just a few machines, doing the work the people couldn’t or wouldn’t. Lured by good pay and secure jobs, they flocked to build better lives for themselves. But more and more machines came, and they got bigger and smarter. They didn’t need skilled labour any more, just button-pushers. Pretty soon, the people were working for the machines, not the other way round. After a while, it was hard to tell where the machines ended and the people started. Everything was a factory. Even the music came off a production line. Theatres turned into car parks. Ballrooms turned into retail shops. The city’s culture started to rust away. The machines built this city; the machines will destroy it. In a quiet suburban town to the southwest, three high school friends have other ideas. They won’t be enslaved by the machines. They’re going to use them to create the future. But this is no cyberpunk novel. This is early 1980s Detroit, and our high school heroes are busy inventing techno. And, quite by accident, inventing ways of working which a lot of digital service creators might recognise today. There wasn’t much going on in Belleville, so Juan Atkins, Derrick May and Kevin Saunderson got into music. Like a lot of high school kids, they played in garage bands, but more importantly, they listened. Every night the airwaves brought the sounds of Charles “The Electrifyin’ Mojo” Johnson from Detroit, playing an eclectic mix of P-Funk, Prince, and… Kraftwerk. Something about this monotonous, mechanical music struck a chord with these children of car factory workers. “It sounded like somebody making music with hammers and nails”, said May. Where Motown’s music factory embraced the method of Henry Ford’s assembly line, this music captured the feeling of growing up in the industrial decay of Detroit. Listening to Mojo’s show every night made them aware of the power of music to connect and unite people. They were inspired to become DJs themselves, and started to pick up slots on the local party circuit. Playing records in front of crowds was nothing new in itself. But unlike their contemporaries, May and Atkins weren’t satisfied with merely rocking the party. They wanted to take their audience on a journey. More than just providers of good times, they saw themselves as the bridge between the musicians and the crowd, weaving the records into a narrative that ebbed and flowed, but left the dancefloor in a profoundly different state of mind by the end of the set. Playing other people’s records was all well and good, but Atkins, May and Saunderson felt that to truly express themselves, they needed to produce music of their own. Traditionally, the process of publishing records was a long and expensive one. Artists might be able to make a first demo on cheap home equipment, but if they wanted to record something they could release, they would need to book time in a recording studio and hire producers, engineers and perhaps session musicians. Next came the process of mixing, mastering and pressing up vinyl. Only then did the song reach the listeners’ ears, and there was every chance our artist had spent a lot of time, money and effort producing something nobody liked. The Belleville Three took a different approach. They turned to the newly affordable electronic synthesisers favoured by the likes of Giorgio Moroder and Kraftwerk. With their shared pool of second-hand cast-offs, they were able to skip the expensive studio and record in their own homes, directly onto tape. They could tweak instrument sounds and rearrange their compositions on the fly. And when they thought they had something good, they could simply play it at the Detroit Music Institution on a Saturday night and see how people liked it. This was about more than just making people dance: this was their way of standing up against the destruction of their city, their society, their future. Music as a unifying force, a way to bring people together under a shared experience, and putting the people back in charge of the machines. Ask any designer to tell you what the hallmarks of current digital user experience are, and you’ll probably hear words like “minimal”, “functional” and “elegant”. Form follows function. Less is more. Simplicity and clarity of purpose have become synonymous with “good” design. But there’s nothing modern about this school of thought. Over two hundred years ago, a very similar approach emerged from a most unlikely source. Not some great seat of learning, nor a maverick polymath, but a small group of religious dissidents in New England. The United Society of Believers in Christ’s Second Coming, better known as the Shakers, founded their first permanent communities in the United States in the middle of the 18th century. At one time they had over 6000 followers, but these days they’re rather on the fringe of Christianity, with only two adherents left alive (and I’m not one of them). Despite their small numbers, the influence of the Shakers’ innovations was enormous. From circular saws to washing machines and mail-order seeds, their inventions are still around today. 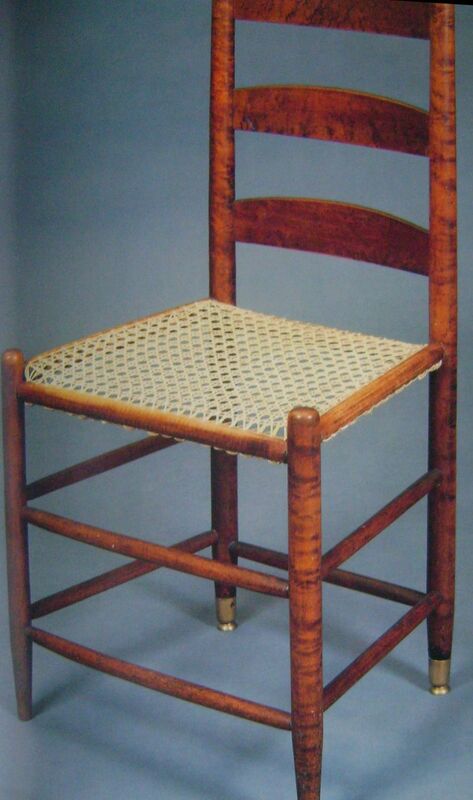 Their furniture, in particular their ingenious hinged-back chair, is revered and sought-after still. As a community, the Shakers may have had their shortcomings (it’s hard to sustain a community in which everybody’s celibate), but as designers, they definitely seemed to be on to something. What can we learn from them today? The goal of the Shakers was nothing less than to build heaven on Earth. They believed that God dwelled within every person, and that through their work they should strive to bring about perfection, to restore the world from disorder and decay. Every ritual they performed, every building they created, every object they designed, was an expression of this goal, and an attempt to get closer to it. It’s the constant thread that ran through their entire way of life, and it made their communities seem remarkably consistent, focused, designed. Try to do the same in your own work. Define a purpose for whatever you’re trying to create, in as few words as possible. At every step in the design process, ask whether what you’re creating directly furthers that purpose. Keep checking that everything is in line with that vision and you won’t go far wrong. Take that purpose to its logical conclusion. 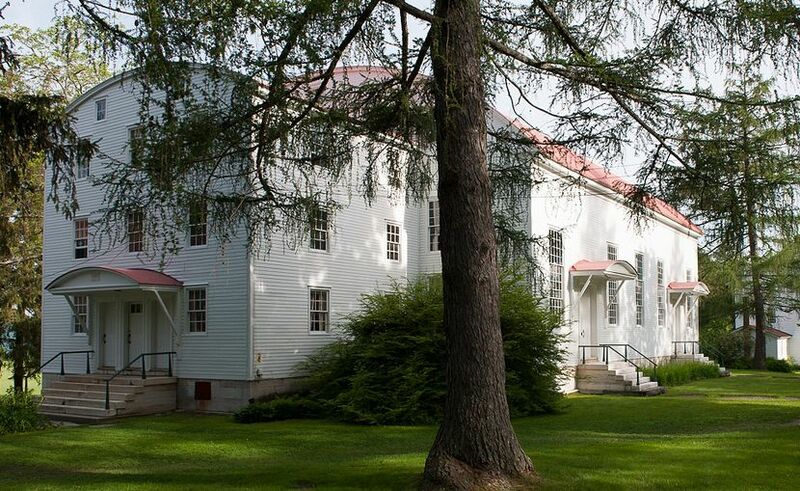 Everybody in a Shaker village worshipped together, so they needed enough space for hundreds of people to meet. In the 18th century, a hall big enough to accommodate a whole village would normally have a roof supported by large wooden pillars. But this was no good for the Shakers, because their religious services involved an unusual amount of dancing and moving around, and pillars would be hazardous. So they invented a kind of arched roof which enabled them to safely whirl around the meeting house. The Shaker Meeting House at Mount Lebanon. Fond as they were of dancing, the congregation couldn’t be on its feet the whole time, so they needed somewhere to sit. But traditional church pews are bulky and heavy, and hard to move out of the way when it’s time to hit the floor. So the Shakers needed chairs. Hundreds of lightweight chairs, which anybody could pick up and move out of the way. And because they are an egalitarian community, everybody’s chair needed to be identical. It’s a problem which just screams for a mass production solution, and unsurprisingly, the Shakers got extremely good at making chairs. Their favoured design was simple, fast to produce and used easily-obtained local materials. It also happened to be very elegant. But where were they going to put the chairs to get them out of the way while they’re, well, shaking? They could stack them, but then they would be back with the columnar obstacles they went to such lengths to eliminate. So they had a better idea: hang them on the wall, from racks of evenly-spaced pegs. This led to pared-down chair designs made from light wood, so anybody could lift them and hang them up… And they hung the chairs upside-down so the seats don’t get dusty. Now that they were hanging up, the floor was clear, so they could give it a good old sweeping. We’re striving for heavenly perfection in all things, remember? But this hall’s big, so it takes a lot of work to get it really clean. Thus the Shakers invented flat brooms that swept the floors faster and better. One invention follows from another, all born from a single goal. Unified design as the result of a unified purpose, with everything they made a manifestation of their beliefs. Although the Shakers’ policy of celibacy made it difficult to sustain a community, it had a major upside: they needed to keep accepting newcomers. These people came from many different places, and many different backgrounds. Each of them brought skills and experiences which contributed to the community: new farming techniques, expertise in engineering, and of course, advanced carpentry. There were no trade secrets in a Shaker village; they shared their knowledge as they shared their food and lodgings, for the benefit of all, and towards a common purpose. As a result, their communities were notably more prosperous and efficient than their neighbours. Embrace innovation like the Shakers did. Always be on the lookout for new techniques, new approaches, new ways of thinking which might improve your craft. And in return, share your knowledge so that others might take it further than you could by yourself. Spurn ornamentation, but not beauty. Shaker designs tend to be simple. Partly because that’s what usually works best, but also because they associated flashy decoration with the sin of pride. However, this doesn’t mean that there was no place for beauty in their work; they simply found other ways to express it. The focus of their effort was on overall form and proportions, as well as the quality of materials and craftsmanship. Thus beauty was a property inherent in their designs, rather than a treatment applied to it. This principle is just as valid for digital services. Gimmicks and fripperies weigh down your designs and get in the way of the user’s goals. Serve their needs first, and only then seek to introduce beauty in your work by adding clarity, smoothness, and elegance wherever you can. All this simplicity, efficiency and harmony didn’t emerge overnight, of course. Their earthly paradise always remained just out of reach, which meant they had to keep striving to get closer to it. This meant constantly honing skills, but also continually improving their designs, which for them meant making them simpler, less ostentatious, more honest. Gentle, steady progress was the order of the day, for God dwelled in the details, and through their work they sought to understand him better. Futurice isn’t a religious organisation, but like the Shakers, we believe that the act of working on something is valuable in itself. That’s one reason why we tell our customers to love the problem, not the solution. This is well worth remembering. As designers, we often tend to reach for the stars in the hope of stumbling upon a revolutionary breakthrough that will make us famous. But the road to everlasting glory is littered with the wreckages of grand ideas, and the burned-out minds that tried to realise them. Unglamorous as it may be, the Shakers knew that patience and persistence were the keys to salvation. Stop trying to make Watch happen. It’s not going to happen. Smartwatches need to go away. They are everything that is wrong with consumer electronics. It doesn’t matter how many watches Apple sell, it won’t ever make them a good idea. 1. Nobody ever asked for smartwatches. Smartwatches weren’t created to meet a consumer demand, because there never was one. Most people just don’t really see the point in watches that do stuff other than tell the time. Sure, there’s a limited market for heart rate monitors for people serious about fitness training. But most people who try out this sort of functionality don’t keep it up, because it’s sort of interesting for a while but turns out not to be very useful. And yes, schoolkids found calculator watches cool for a while in the Eighties, but that was because they were handy for cheating in maths tests, and they became redundant as soon as proper calculators became acceptable for use in exams. Truth is, people don’t need these devices. The manufacturers do. These are products born of MBA thinking and the imperative to expand ceaselessly in every conceivable direction. They’d already persuaded people they needed tablets – an enlarged, less versatile smartphone – so the logical next thing to do was to make a smaller, less versatile smartphone, and once again manufacture demand for it. Partly through marketing, but also by artificially creating a need for them. 2. Smartwatches are ruining smartphones. Phones are awfully big these days, aren’t they? The current flagship offerings from most major manufacturers range from merely unwieldy to something Andre the Giant would struggle to grasp comfortably. Still couldn’t grip an iPhone 6. Where has this trend come from? Not consumers. People aren’t saying “Hey, what I really want is a phone I can’t actually hold in my hand”. That would be stupid. And the manufacturers themselves know they’re too big. Consider this – every handheld device* Apple made from the original iPod to the iPhone 5S was the same width, give or take just a couple of millimetres. This is because they know that’s what fits best in most people’s hands. So why did they throw their own design principles out the window with their latest models? To make the Watch appealing, of course. Surely you didn’t think it was a coincidence that Apple phones stayed smaller than the competition for years – until the Watch was ready? No, this is the plan, and it’s not just Apple that’s doing it. Make the phones annoyingly cumbersome so that you don’t want to use it so often, and plug the gap with a watch. Why sell people one device that meets all their needs when you can sell them two inadequate ones? *Except the iPod Nano and Shuffle, but they were smaller, so the point stands. 3. Smartwatches annoy your friends. For better or worse, we now live in a world where people fiddle with their phones all the time. Reading notifications, sending messages, even just checking the time. This can make smartphone users appear distracted, only half there. It’s a fairly new social phenomenon, and as a result, people are still somewhat flexible in how they react to such behaviour. Some find it rude, but most tolerate it to a degree, because we all do it sometimes. But do you know what’s a guaranteed way to make your companions think you would rather be somewhere else? Yes, well done, Apple et al. Your masterplan to liberate us from constantly fiddling with our phones is to replace it with a gesture which tells everybody in the room you’re bored out of your mind. They should have realised this very early on in testing. But Apple are so paranoid that they would never have allowed this product to be seen in public until it was launched, so they never got that really essential and frankly bloody obvious piece of user feedback until it was too late. In their delusion that they were reinventing the watch, they forgot to take into account that the world has several centuries of social conventions around watches which won’t easily be undone. I tried to find another way to put this, but there’s no beating around the bush – they aren’t good at anything. Not as a watch, not as a communication device, not as an information display, nothing. Let’s take the most basic piece of functionality of a watch, telling the time. It can’t even do this effectively. Yes, yes, the display switches on when you look at it, very clever. Except it doesn’t, does it? It switches on after a short delay because the processor’s been hobbled in the name of battery life. Thanks, Apple, I’ve always wanted a watch that won’t even tell me the time until it’s good and ready. They seem to know that trying to get anything done by touching the screen is an exercise in futility, because you won’t be able to see what you’re tapping so their solution is to make the crown into a side-mounted scroll wheel. You know, just like the Sony J7 phone from 2001. Yeah, great. It picks up every other voice in the room as well as yours, making conversations a garbled mess for the person on the other end, and Siri even more of a farce than usual. Phones at least know they’re going to be somewhere near your mouth when you’re talking and so can intelligently cancel out background noise. A smartwatch might be at your mouth, or at your keyboard, or under your coat. Plus, talking into your watch makes you look like an arse. So that leaves non-verbal communication. Surely it’s competent at that, at least? No. Its main purpose seems to be to notify you of stuff that you can’t really do anything useful about, and so you end up getting your phone out anyway. Progress, eh? For example, you can read texts, but you can’t reply to them because there’s no bloody keyboard. No, hang on, you can reply to them, but only by choosing one of a selection of canned responses it “intelligently” offers up based on what it’s gleaned from the content of the message. I think we all know how well that’s going to go. Oh, and they’re charging people up to seventeen thousand dollars for a watch that can’t survive falling to the bottom of a swimming pool. Ideal for fitness training, indeed. Please don’t buy one of these things, you’ll only encourage them. If you endorse this with your money, they will continue to produce cynical, pointless baubles which serve only to make devices we were already quite happy with less useful. I wrote this article a few months back for Digital Age magazine. Obviously it got translated into Turkish for publication, so I thought I’d post the original English up here. Life was simple in the early days of the web. Pages were accessed – slowly – by a browser like Mosaic or Netscape. They mainly consisted of text with the occasional grainy image. Interactivity was minimal besides clicking on links to other pages, and maybe the occasional form here and there. Time passed, Wi-Fi unshackled us from our network cables, and before too long we were able to use our phones to access, at painfully slow speed and high cost, WAP pages that made the websites of the time seem like the acme of sophistication. And then along came the iPhone and everything changed. Suddenly we had a mobile device almost as capable as a desktop, and mobile web use took off faster than the networks could keep up. Many sites of the time weren’t designed to work well with touch interfaces, but it was a big leap forward. Today we have a vast and ever-changing array of devices to suit every budget and pocket size. This has necessitated a rapid evolution in our approach to web design. We can’t possibly make different designs for every available shape and size of screen, and so responsive design was born. From this grew the pervasive and in many ways regressive trend for flat design, which often compromises usability, but makes designers’ lives easier. Mobile-first has become the dominant approach of the day. By starting with the most limited interface – the mobile phone – and adding functionality where it makes sense, you always have a useful baseline system which can work anywhere, on any kind of device. This approach, of bringing the system to the user however they choose to access it, has brought us a long way. We now can use our phones for complex tasks like banking and booking flights, and sometimes the experience can even be nicer than on the desktop. But mobile first is based on a flawed premise. Designing a great service is about more than than just making the same thing work on different devices. It’s not only about what device they use to access the service. There’s much more we can do if we think about where they are, how much time they have, and what else they might be doing at the same time. We can go beyond simply making the same thing in different sizes, as with responsive design, or even tailoring a basic system to suit the device it’s being used on, as with mobile-first. We can design a system such that every interface, every device, complements and improves the experience on every other. We’re calling this approach omnichannel design. I’ll explain by way of an analogy. Think of our basic 90s-era website as a single violin, playing a simple melody by itself. If it’s played well it can be extremely pleasant, but on its own it’s limited. A responsive site is like a string quartet all playing that same melody in unison. The notes they play are exactly the same, but the tone of each instrument is different. This will give a more rounded sound than the solo violinist, but other than that, it doesn’t add anything more to the experience. In a multichannel site, our string quartet are playing in harmony. Each musician plays their own part, composed to complement all the others, and the effect is nuanced, balanced, more complete. Omnichannel is a full symphony, where every instrument plays a part written for its strengths. The different sounds support and complement each other. While one section of the orchestra leads, others may take a back seat. Melodies pass from one section to the other. It’s the richest, most powerful listening experience of all. Instead of seeing different kinds of devices and interfaces as a burden, adding to development and testing time, we view them as a gift, a way to enrich the user experience. Now we can always give them what they want, when they want it, in a way that suits them best. Or that’s what we’re aiming for, anyway. But how do we do it? Taking a platform we’ve already finished and adapting it just isn’t enough. To make our digital symphony we need to design it in from the start. We begin by boiling the service we will eventually produce down to its simplest, most abstract essence. We describe it in the simplest terms we can, ideally, in a single sentence. What do we want to give our users? If we can lock this down, everything will flow from there. When we have our basic concept, we can start to think about the design pillars which will support it. We do this based on what we know about our users – demographics, their ability and propensity to use various kinds of devices, their goals, their expectations, their feelings, and so on. Before we design anything, we have to be sure that we understand this service inside-out in the abstract. Forget about platforms for now, they’re just how we’ll express our service in the end. Work outwards from the user’s intentions and feelings, and step by step the service will begin to define itself. Figure out the actions they will want to take, and it will be clear what the service will have to do to meet their expectations. This tells you what functions you have to provide, and then it’s just a matter of organising these functions logically so people can find their way through and around them. and the service should mould itself to fit the shape of the vessel. But it’s not just about the size of the device, it’s about what people want to do with it. Users don’t always choose the optimal device for the job. Sometimes they use more than one device for the same thing, or even at the same time. The term “mobile” is a bit misleading – often people aren’t actually on the go while using their phone. They might just be passing the time, or looking something up quickly while watching the TV. Particularly in developing countries, it might be the only device they have. Tablets are a companion device, filling the gap between phone and laptop, that’s easily at hand. It’s great for supporting and enhancing content and tasks from elsewhere. Touch screens aren’t ideal for typing on, so the computer is the device of choice when there’s real work to be done, such as filling out forms. Straightforward, linear customer journeys, started and finished on the same device, are increasingly a thing of the past. They’re moving from one platform to another, from the real world to the digital one, and they expect a consistent quality of experience. To ensure they get it, plan your service from the inside out. Last weekend I was lucky enough to be invited back to the Push Conference in Munich, where I gave a presentation last year. As I listened to the presentations and mingled with guests and speakers, I noticed an unintentional theme kept cropping up, around how far digital design still has to go. Early on Friday, Razan Sadeq gave an interesting talk about how Sherlock Holmes was the true father of user research, with his evidence-based approach to solving problems. She showed how user research not only helps to provide evidence to back up hypotheses about user behaviour, but also provides insights you otherwise simply wouldn’t have. The problem is clients hardly ever want to pay for it. So most UX designers have got used to just getting by without, and still managing to do an OK job – which of course means the client thinks there’s no need for it. Round and round we go. But if we don’t explore new avenues to find knowledge about the problems we’re trying to solve, we never improve things past a certain point, and we never produce anything truly innovative. Everything ends up something the same, because it’s all based around the same preconceptions, the same second-hand notions of what users want. In an entirely unrelated subject, coder Markus Eckert spent 45 minutes extolling the beauty of custom easement curves. In days of yore, if you wanted something to move across a computer screen from A to B, the only option available to you was a straight line with a linear rate of movement throughout. No acceleration, no deceleration… no realism. Then people like Apple (I know they weren’t the first) started to understand the benefits of making on-screen objects behave more like their real-world counterparts, and before long they had inertia and friction and so on. So an easement cuve is what you call the graph you get if you plot the rate of movement of one of these objects over time. They ease from their static position into movement, and ease back to a stop again. Nowadays, it’s dead easy to use these in whatever you’re building, because most commonly-used code libraries have standard ones built in. You’ll even find them in Keynote so you can apply them to your whizzy slide animations. The standard curves, are generally good enough for most people most of the time. Not Markus, though. He’s bored of them, so he makes his own. And he spent an entire slot talking about them. It was surprisingly fascinating, and some of his clever routines which make a page move like a curtain are seriously funky. It’s that a lot of people don’t think either of these things – user research or nerding about with physics simulation – are important. But these people are fools. Other fields of design are full of people like Markus. BMW employ 14 sound designers whose sole job is to come up with notification noises which befit the character of the car. And we all know how important the sound of a car door closing is to its perceived quality, which is why countless engineering hours have been spent over the years on getting it just right. Perceived quality is a relatively new thing in digital interface design, though. Frankly, it’s a new thing in digital hardware design too, and much of it’s still horrible plasticky crap. But in a world where phones and computers and everything else are Good Enough in terms of functionality and speed, how do you differentiate your product from the crowd? Maybe it’s by using custom easement curves. Or maybe it’s by paying more attention to your users. Or something else. But the point is these aren’t things you can cut corners on any more, because given a choice between two products of equal performance, the one with the higher perceived quality will win out in the customer’s eyes every time. I recently did some work for a financial client in Italy. About the first thing the team did when the job began was to try to understand the current state of play. So as well as doing the obvious and checking out some banking websites, they sought to gain insights wherever they could by doing things like visiting branches, using cash machines, and most importantly, talking to customers of the bank. Not exactly revolutionary stuff, right? And yet to get to do this is a rare privilege. Most clients won’t spring for the budget for that sort of caper – “When can we see the finished designs?” is their eternal refrain. They don’t see the value of it, don’t see how it can contribute to the final output. Just make us a website, please. You can do that, can’t you? But by not doing this preliminary research they’re missing a great opportunity. In this particular case we picked up a few insights, sometimes by way of off-the-cuff remarks from interviewees, that went on to shape the entire nature of what we delivered. We ended up with a service that’s got some unique features that nobody else has got to offering yet, which will really make it leap ahead of the competition. All because we spent a bit of time listening. I’ve decided I should start blogging my thoughts on design-related topics on here. Anybody that knows me is aware that I’m not short of an opinion or two. For better or worse, I thought I might start putting them online so that they reach a wider audience than whoever I’m talking to in the pub. The world can take notice or ignore as it sees fit.